Do you often run late because getting ready can be stressful? Are you crouching down to apply mascara as you feel around for a socket for your hairdryer? Do you knock things over, searching through a drawer for nail polish? A make-up vanity in your master bathroom design is the ideal solution. It’s not just for Hollywood elite and, with a little planning, you can have everything you need in one handy place. The fact that you’re sitting down is calming and with ample lighting there’s no need to squint or stress ever again. If you have a free nook in your bathroom design, it’s the perfect space for a makeup vanity. Go for a traditional, freestanding style or look at a custom built one to fit perfectly and complement your bathroom cabinetry. Attach sconces for extra lighting and make the room feel bigger with a large mirror. Sit down and relax as everything you need is at your fingertips. Blend your makeup area into your vanity to give your bathroom design a unified feel. A standard vanity height is over 30 inches but remember it’s a few inches lower if accommodating a seat. 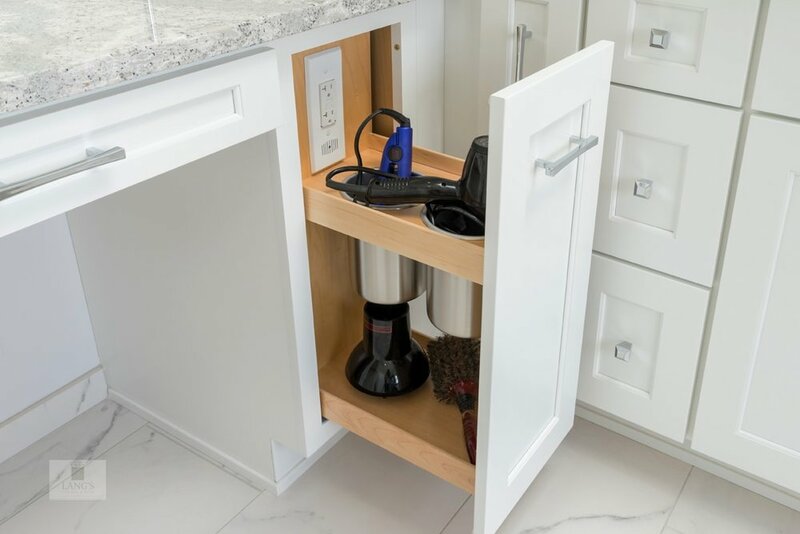 Attach it just below the higher countertop or to bridge two sinks. 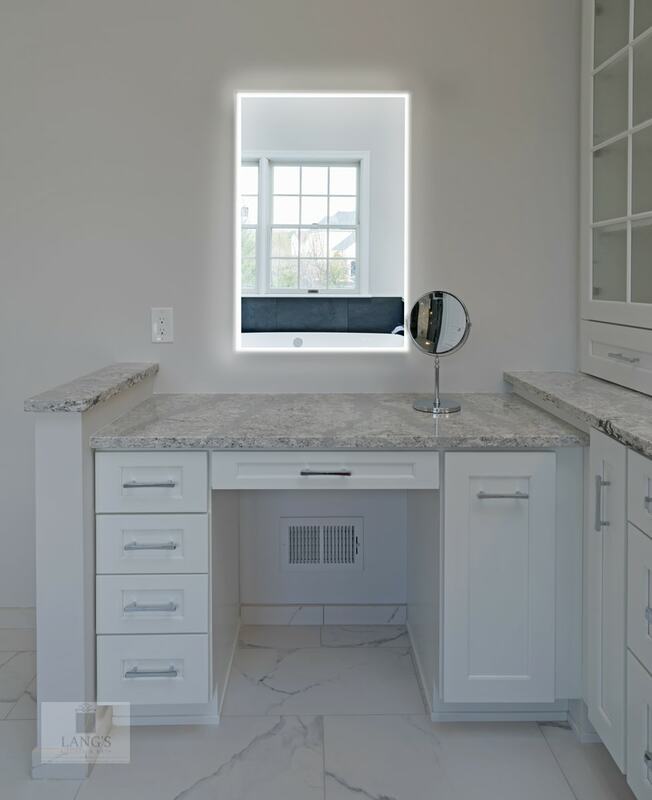 This bathroom design in Doylestown, PA includes a glamorous makeup vanity at a right angle to the main vanity, with a custom lighted mirror and taking advantage of the natural light from a window on the opposite wall. If you have space and a little imagination, think about installing full cabinet storage accessories for your makeup station. 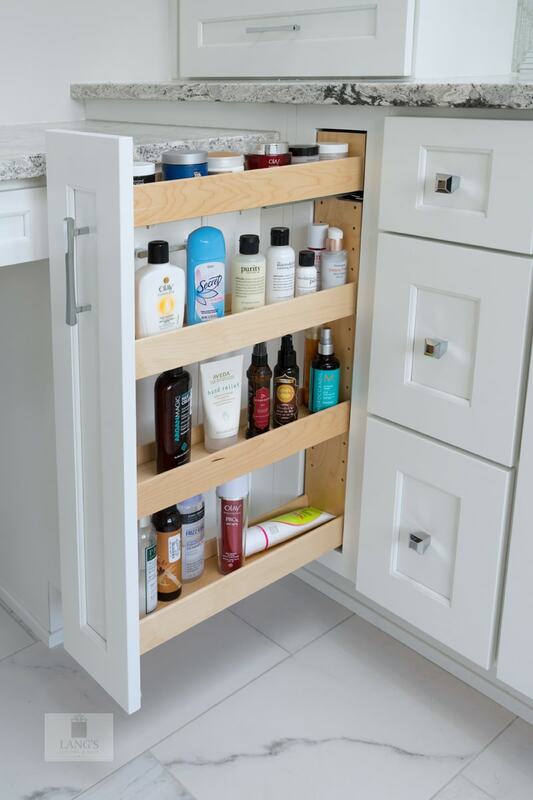 Beauty products can be easily accessed behind glass-front doors while also offering space to display decorative bottles of perfume, with hairdryers and accessories in drawers and lower cabinets, leaving the countertop free for you. If you have enough floor space in your bathroom design, you can go full Hollywood! Why not place your makeup vanity in a prominent position with a comfortable chair and bespoke storage? This Doylestown bathroom’s makeup vanity holds a pull-out grooming cabinet. Insert a tiny sink in the counter to let you stay seated and aim to position it near natural light. Make this vanity a centerpiece, where you will love getting ready. If you really can’t fit a dedicated makeup vanity, then just make space for yourself in your vanity cabinet. Once you have adequate storage, lighting and a decent mirror you’re good to go, saving precious time before you go out. If you have space but not necessarily the budget for a customized makeup vanity, then mix different pieces of furniture to make your own style. A unique mirror, table, chair, lampshade or drawer pulls give character. Create a haven just for you, with special pictures or keepsakes. Just make sure everything fits in with the look of your bathroom design. Why not incorporate a makeup vanity in your bathroom remodel? Our bathroom design experts can advise you on all options and there are many inspiring bath designs in our gallery. Contact us today to get the most from your vanity cabinetry.